FIGURE 6.39 Decay of some simple alkanes during an episode of surface-level 03 depletion at Alert, Canada, and at an ice island upwind. Also shown are the relative alkane concentrations for a "normal" time without 03 depletion. The dotted lines show the ratios expected if the alkanes are being removed by CI or OH, respectively (adapted from Jobson et al., 1994). chlorine atoms, and their ratio should remain constant if reaction with OH is the major removal process. As seen in Fig. 6.39, during ozone depletion events at Alert, Canada, and at an ice island upwind, the removal rates are consistent with chlorine atom reactions. On the other hand, in "normal ozone" conditions, the hydrocarbon loss is indicative of OH kinetics. Aldehydes and ketones have also been measured during these ozone depletion events. Although these are expected to be generated from the oxidation of organics by chlorine atoms, the levels are not completely consistent with this as the only source. For example, Shepson et al. (1996) report that much higher concentrations of HCHO are observed than expected from such oxidation processes. 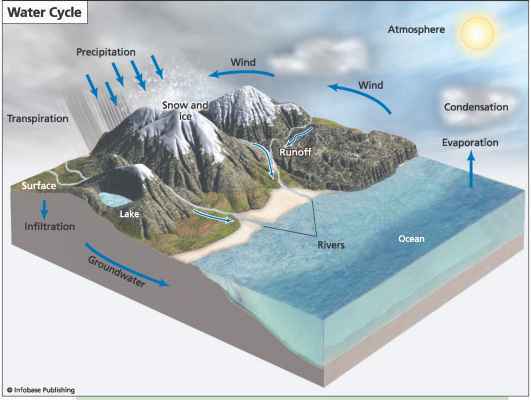 High concentrations have been measured in the interstitial air in the snow-pack in the presence of sunlight, suggesting that photochemical processes in the snowpack generate HCHO (Sumner and Shepson, 1999). ft is interesting that recent satellite observations (e.g., Richter et al., 1998; Chance, 1998; Wagner and Piatt, 1998; Hegels et al., 1998) indicate that BrO is formed over large parts of the Arctic during spring, coincident with retreating sea ice and increasing radiation. Hopper et al. (1998) report that ozone depletion occurs in a layer above the sea ice, both observations again indicative of a seawater source for the bromine. Arctic at polar sunrise. The mechanism likely involves regeneration of photochemically active bromine via heterogeneous reactions on aerosol particles, the snow-pack, and/or frozen seawater. The source of the bromine is likely sea salt, but the nature of the reactions initiating this ozone loss remains to be identified. For a review, see the volume edited by Niki and Becker (1993) and an issue of Tellus (Barrie and Piatt, 1997).